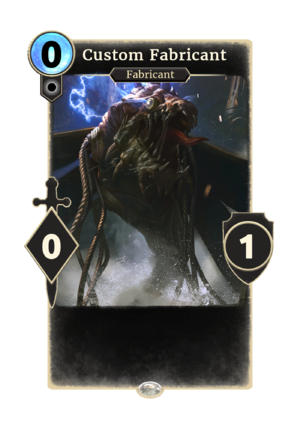 Custom Fabricant is a common Neutral creature card. It cannot be included in a deck, but is created by Fabricate. When you summon Fabricate, you'll get to choose between three different versions of Custom Fabricant. Their cost, attack, and health values are random, but will always be in ascending order. For example, the values of version one can be anywhere between 1 and 10[verification needed — never got higher than 7 for now] and the values of version two can range between 2 and 11, but will always be higher than the values of version one and lower then those of version three and the values of version three will range between 3-12[verification needed — never got lower than 4]. While the chosen ability persists into the discard pile, copies of the custom fabricants will not keep the ability. The pilfer ability applies the Acquisition card effect. The summon ability applies the Fabricated card effect.